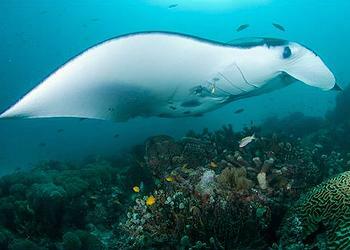 JAKARTA, Indonesia, February 24, 2014 (ENS) – Indonesia has announced legislation that will protect all manta rays within its nearly six million square kilometer exclusive economic zone, creating the world’s largest sanctuary for both species of manta rays. On January 28, Sharif Sutardjo, Indonesia’s Minister of Marine Affairs and Fisheries, declared both the giant manta ray and reef manta ray as protected species under Indonesian law. Indonesia has been the world’s largest fishery for rays and sharks for nearly 30 years, but a new review conducted by two Indonesian government agencies and a coalition of conservation organizations, concluded that rays are worth up to 2,000 times more alive than dead, due to the tourist business they attract. Conducted by the Indonesian Ministry of Marine Affairs and Fisheries and the Indonesian Institute of Sciences, with input from Conservation International, the review included findings from a recent study, led by WildAid, the Manta Trust and Shark Savers, showing that a single manta ray is worth an estimated US$1 million in dive tourism revenue over the course of its life. The same animal is worth between $40 and $500 if caught and killed before the end of its average lifespan of 20 – 30 years. “As the world’s largest archipelagic nation, it is important for Indonesia to maximize economic returns from our marine resources,” said Sharif Sutardjo, Indonesia’s Minister of Marine Affairs and Fisheries. “This action will fully protect both species of manta rays in Indonesian waters and ensure improved management of their populations,” he said. 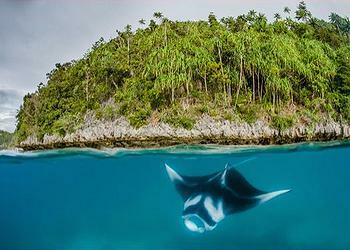 An archipelago of 17,500 islands, the Southeast Asian nation is one of the few places in the world where both species of manta ray – the oceanic manta ray, Manta birostris, and the reef manta, M. alfredi, can be observed easily by tourists. With wingspans of up to 25 feet, a docile nature, intelligence and grace in the water, manta rays are a top marine tourism draw. They can grow up to 25 feet in length and weigh as much as 3,000 pounds. But the demand for products made from manta rays has increased in the past decade and has led to steep declines in ray populations worldwide. Rays are now classed as Vulnerable to extinction on the IUCN Red List of Threatened Species. Caught for their gill rakers, manta products are sold mostly in the Guangzhou region of southern China as a medicinals to treat everything from chickenpox to cancer and infertility. Yet, manta ray products have no known curative properties. They are not considered a formal component of Traditional Chinese Medicine nor are they recognized by most TCM practitioners. The Convention on International Trade in Endangered Species, CITES, placed manta rays on its Appendix II list in March 2013. This listing requires the international trade in mantas or their parts to be strictly controlled to prevent overexploitation and extinction. “Mantas have a life history that makes them susceptible to overfishing,” said Dr. Mark Erdmann, Conservation International’s senior advisor to the Indonesian Marine Program and one of the leaders of the ministry’s study. “They take up to a decade to mature and females produce only one pup every two to five years. A given female manta might produce maximally 16 pups over her lifetime, with most producing even fewer. In many ways, manta reproduction is more similar to humans than to other fish,” said Erdmann. This national ban on manta ray fishing comes less than a year after local Indonesian regency governments, including the top marine tourism destinations, Raja Ampat and West Manggarai declared shark and ray sanctuaries throughout their entire territorial waters. With this new regulation, a total of four species of sharks and rays, along with whale sharks and sawfish, are now fully protected in Indonesian waters. The ministry is now considering expanding protections to other threatened shark species such as hammerheads and oceanic whitetip sharks. In protecting its manta rays, Indonesia joins a growing list of countries and states that have granted full protection to their manta rays including: Australia, Ecuador, the Maldives, Guam, Yap, Palau, the Philippines, New Zealand, Honduras, Mexico and the U.S. states of Hawaii and Florida.